Since Chimpanzees (also called chimps) are the closest living relative to humans, it is fitting that they have their own category in Facts About Intelligent Animals. The reason why so many kids love seeing them at the zoo is partly because of their likeness to humans. When Jane Goodall, who was a British anthropologist, went to study Chimpanzees in Tanzania where they live, she made an important discovery. What she found was that they are one of only a few animal species that are able to use tools. Read on to learn more interesting facts and information about Chimpanzees written for kids and adults. Click here for a great selection of Amazon.com books about Chimpanzees. Chimpanzees have a lot in common with humans, in fact 96 percent of our DNA is found in Chimpanzees. Studies show that Chimpanzees are able to exhibit altruism, a trait not typically found outside the human race. 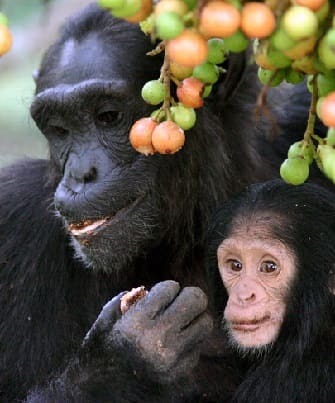 They are known to share things like food with other groups of chimps and even other species of animals as well as take care of chimps that are not biologically their own. The Chimpanzees strong cognitive abilities enable them to learn sign language in a controlled environment. To communicate with one another, Chimpanzees use a complex system of vocalizations, body language, human-like facial expressions, and hand gestures. They even exhibit a laughter vocalization, somewhat similar to humans. There are two different species of Chimpanzees on earth, the Common Chimpanzee and the smaller Bonobo or Pygmy Chimpanzee. Broken down even further, there are four distinct subspecies. Chimpanzees have many similarities to humans including their sense of sight, hearing and taste, their ability to walk upright, their ability to feel a variety of emotions, and even certain blood types are the same. Chimpanzees are native to Africa. They live mostly in African rainforests but sometimes inhabit the grassy African plains as well. Chimpanzees live in groups called communities of anywhere from 15 to upwards of 120 chimps with a designated alpha male as the leader. Chimpanzees are an endangered species. It is estimated that no more than 300,000 Chimpanzees are living in Africa today. This figure is down a shocking 90 percent from just twenty years ago. Chimps use tools to make nests up in the trees where they rest and eat during the day and sleep at night. Like a human baby, the Chimpanzee baby is very dependent on the mother for several years. Baby chimps need their mothers around for a minimum of five years. Because baby chimps require so much time and energy from their mothers, most females will not have a baby more frequently than once every five years for a total of between 4-6 offspring during her life. Chimpanzees are mainly omnivorous, with fruits and plants being the main staples of their diet, but they do also eat insects, eggs and other small animals. Chimpanzees can live a long life. In the wild they can live up to 50 years while in captivity they can live well into their sixties.